We practice Kundalini Yoga in the morning to give us added energy for the day. Ideally we begin our practice before sunrise. We can also practice in the evening before dinner for revitalization after a busy day and receive energy for the evening, and to relax before bed for a restful sleep. Practice in a clean, quiet place reserved for you spiritual practice - definitely away from the computer and your cell phone! Do not eat a meal before your practice, but neither should you practice when you are very hungry. A few almonds, for example, can give you the energy you need. It is best to wear white or light colored clothes in natural fabrics. If your hair is long enough, tie it up on top of your head, focusing the energy on the crown chakra. A head covering also focuses and helps contain your energy. If your practice space is warm enough, be barefooted. Taking a cold shower first is optimal and a basic teaching of Yogi Bhajan. You may also choose to start with warm but end with cold, to get your body systems awakened and blood flowing. Begin and continue your practice at your own pace. There is no contest to see what difficult poses you can get into. The goal is to activate your glandular system and strengthen your nervous system so that have more energy and feel more alive. Go to your limit but not beyond. Only you know your own body and what works for you. Possible touchstones include activation, gentle stretch and rhythmic movement. Take 30 seconds or more to relax between exercises and be with the energy as you experience it in your body. The energy will automatically adjust and go to where it is needed. Your job is to be present, and not consciously try to make something happen. If you do the exercises, something is already happening. One of the wonderful things about Kundalini Yoga is the discovery. Allow yourself time to discover what is taking place. Focus and attention are important tools to achieve optimal results. While you are doing these exercises, put your attention on the part of the spine that is moving or being activated. The energy originates in the spine and flows out through the body and into the energy field. The spine is where you will feel the flow of energy. Notice which parts of the spine feel warm or even hot and where there are no feelings or numbness. This information will indicate where your energy is flowing and where it is not. For the Kundalini to flow, the whole spine must be open. Kundalini is our vital, creative energy that flows through us all the time. The amount that flows through us determines our aliveness and awareness. The goal of practicing Kundalini Yoga is to GRADUALLY increase the flow of energy. 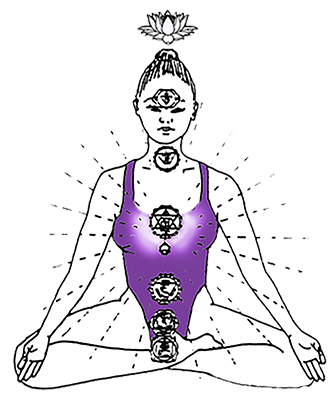 Using these methods, the awakening of your Kundalini is gradual. Do not expect huge rushes of energy, but rather a gradual expansion of consciousness and increase in vitality that evolves over time. The moments between exercises which should be at least 15-30 seconds and up to 1 minute if you choose. Executing the exercises is the activation part of the practice. The exercises stimulate the glandular system, loosen up the spine, massage the muscles and strengthen the nervous system. Between exercises is the passive part of the practice. DO NOTHING, simply be aware of what is happening. Let the energy flow. It will adjust what needs to be adjusted and go where it needs to go. Daily Practice - How Long? The time it takes to do a kriya depends on for how long you do each exercise. The deep relaxation after the set is an additional 5-10 minutes. The silent meditation is also between 3-11 or more minutes depending on the time you have. Tailor your practice times so that you do not feel rushed. The more relaxed and present you are to what you are doing and what is happening, the better the results and the more awareness you will cultivate. Many of our students have indicated that they have 1-2 hours per day to devote to the practice of Kundalini Yoga. You will achieve striking results with such a 1-2 hour daily practice! For those who have less time, consistent practice also produces positive results. I always tell people PROGRAM YOURSELF FOR SUCCESS. If you can do 5 minutes a day, do 5 minutes EVERY day. Then increase your time as you can. Do not start out with the false hope that you can do 2 hours, do it for one day and then stop your practice. Once you have established a program that works for you, continue practicing a set for 40 days. 40 days is the yogic time for breaking a habit. 40 days breaks a habit. 90 days installs a new habit. 120 days encodes the habit. 1,000 days leads to mastery. The optimal time to begin a new set or meditation is on the New Moon. You should set your intention on the New Moon and start as soon as you can after that date. We build our practice one step at a time. Kundalini Yoga and the spiritual path are so rich. When we take one step at a time we can make a lot of conscious progress. What happens if you miss a day in your 40-day program? This is not optimal, but it is not the end of the world. If this is your very first meditation or kriya, follow the general rule and start counting again from day one. Discipline and commitment are required for spiritual advancement. It takes time to change energetic patterns and habits and to install new ones. But missing a day does not discount the effect of the previous days. Keep going. If you have been practicing daily for a year or so, perhaps for the one missed day, you may need to do an extra 7-10 days. It all depends. For example, if for some reason one day you can’t practice your meditation for the full 31 minutes, do 5 minutes to sustain the effect. Basically keep going until the negative effects are corrected and you achieve the results that you are looking for. It is important to remember to integrate your awareness after every yoga and meditation session. We do all the exercises so that we can shift our awareness. Jumping up after a Kundalini Yoga session without a conscious deep relaxation or silent meditation is like a meal without dessert or going to the beach and not going for a swim. The relaxation and silent meditation with a humble prayer play a big role in integrating and anchoring in the effects of your practice. The effects last longer and you are able to stay more consciously centered during the day. It will also be easier to hold the higher vibrations during the day. During their moon cycle, women are advised not to do strenuous abdominal exercises, including leg lifts, Stretch Pose, Breath of Fire, and Sat Kriya, and inverted postures like Shoulder Stand. Instead, women need to focus on grounding and not on raising energy, this being more of an inner meditative time than an active one. However, it is important to move the energy in the lower chakras. Cramps are caused by stuck energy. Even walking and gentle leg exercises can help keep your energy moving and prevent discomfort. Adjust the level of your cold showers during your moon cycle. Be sure to end with some level of cool to not feel sluggish. Do some wake up exercises or Breath of Fire (in or out of bed) to get you going. Take a cold shower (or end a warm shower with cold to stimulate blood flow to the capillaries). Sit down on your mat and take a few minutes to be silently present to your breath and feel the sensations in your body. Tune in with the Adi Mantra: ONG NAMO GURU DEV NA MO. Do warm up exercises of your choice. Enjoy silent time with yourself. Conclude with a prayer, closing song, and three long SAT NAMs. Do some standing grounding exercises if you wish. In addition to morning sadhana, as a part of it, or as an evening meditation here is a meditation that can be done for 5, 11, 22 or 31-minutes. This is a very blissful meditation that keeps you in your body. When you need help chant this mantra. Vibrating with this mantra produces healing, magic and miracles. Now that is a handy channel to tune into! Enjoy! GURU, GURU, WA HE GURU, GURU RAM DAS GURU. Sat Nam and have fun!